After working for a mineral water distributor in Germany, Martin attended Doemens Beverage Academy in Munich, one of three German colleges specializing in all aspects of the wine, mineral water, juice, and especially the beer industries. After graduating from Doemens, Martin went to work for Scottish & Newcastle, one of the top-ten macro-breweries in the world, responsible for such famous cold-ones as Fosters, Newcastle, Strong Bow, and Baltika. Upon returning to the states with an extensive education and experience in the beer business, Martin decided it was time to share his passion for great German beer with his stateside friends and neighbors. Martin created his own recipes for two distinct German styles to be brewed according to the German Purity Law of 1516, using the same commitment for quality followed by the Germans for centuries. Importing grains, yeast, and hops directly from Germany, Martin brews his beer domestically using only authentic German ingredients, except for water. This results in a virtual German beer with a freshness characteristic of California micro-brews. 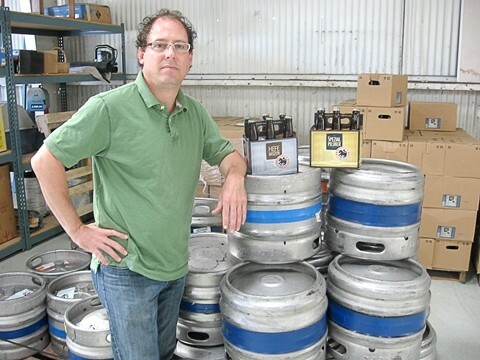 So why did the brew master choose San Luis Obispo as the base for his dream brewery? Like so many tourists, Martin frequently visited the Central Coast while vacationing in California, and eventually decided to make the area his permanent home. The two styles currently available from Einhorn are a Bavarian Hefeweizen and a North German Spezial Pilsner. Martin hopes to add a seasonal style, and perhaps an Altbier or Schwartz bier style to round out the spectrum. Einhorn Beer can be purchased at local grocery and liquor stores, and Martin plans to soon distribute his beer to local restaurants and bars as well. Visit einhornbeer.com for a weekly updated list of nearby vendors that offer Einhorn Beer.